Children from Robert Le Kyng Primary School shrugged off the threat of Hurricane Barney to plant bulbs which will bloom just as a new pedestrian-cycle path is unveiled in the spring. The children planted around 100 tulips, daffodils and crocuses close to the Cambria Bridge play area, which forms part of the route for the soon to be refurbished Southern Flyer cycle and pedestrian pathway. 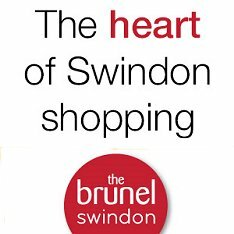 The Southern Flyer, which is approximately three miles long, will join up West Leaze in Wichelstowe with Farnsby Street in the town centre and will take in Peglars Way, Beavans Bridge, Wootton Bassett Road, Turner Street, Joseph Street and Canal Walk. 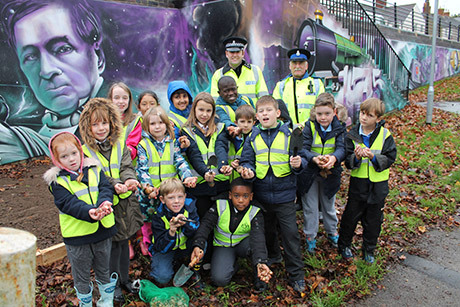 The project to plant flowers at the Cambria Bridge section of the cycle path is part of a partnership project involving Robert Le Kyng Primary, the Council’s Highways and Central Locality teams as well as the Town Centre Neighbourhood Policing Team. The bulbs were provided by the Council’s Streetsmart team who were on hand to help the children with the planting. The children were also given plant pots, bulbs and compost by the Council’s Highways team so they can grow their own bulbs at school.